Winter is just around the corner. For many of us, it’s really just a matter of weeks until the day we go to get in our cars, just to find the car locks frozen. We have some tips on what to do when that happens. But before we get to that, we’re going to tell you how to prevent frozen car locks in the first place. Use Hilco spray lubricant to stop car locks from freezing. Spray lubricants are your secret weapon against frozen car locks. That’s because lube displace moisture. In other words, it prevents water from collecting and freezing in your locks. We recommend Hilco Lubricant in this case because it is specifically made for displacing moisture on mechanical equipment. Unlike WD-40, You can use it as often as you need to without worrying about it degrading your lock tumblers over time. This is one of the best products I have used. We have used it on hurricane shutters, guns, doors, and other open metals. When we used it on our hurricane shutters it did not gum-up in the hot sticky weather. Now for my guns it is the best cleaner I have ever used, because it has a nice odor and it is perfect product to use after I clean my weapons. I stopped using W40 over using Hilco lube and would not use another product for my metal products. Spray the lube outside and inside the lock. The easiest way to get spray lubricant inside a car lock is to spray your key, insert it into the lock and turn it slowly. Do that a couple times to ensure the inside of the lock is completely lubed. You should also spray Hilco around the frame of your car door to prevent it from freezing as well. How to unfreeze car locks. So, if you are reading this post after the whole “ounce of prevention” ship has sailed, don’t fret. 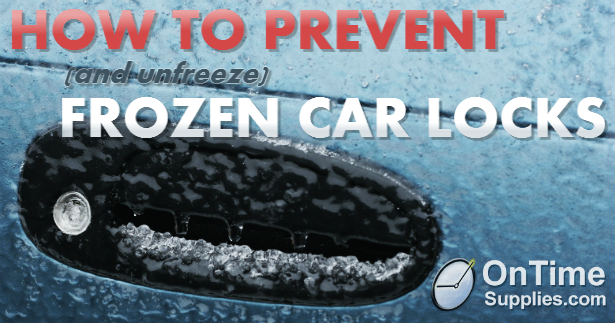 We can help you unfreeze your car lock. Try heating the key with a lighter or matches (this is probably the only time in life it pays to be a smoker). Most car keys have plastic heads, so you don’t want to get them too hot. Just warm enough to melt ice. After you heat your key, insert it in the lock and try turning, gently. You don’t want to try to force the key because it might break, and suddenly, your problem just got a whole lot bigger. If that doesn’t work, break out the HILCO Lube. Spray lubricant will melt ice. Eventually. It’s a little slow going, but at this point in the process, you’re probably already late anyway. Just coat your car key, insert it in the lock and wiggle gently until it turns.What’s that you say? You didn’t take our advice and pick up a can of HILCO back in November? Vaseline or other household petroleum jelly will (slowly, slowly) melt ice and do in a pinch. Once you unfreeze your car lock, do yourself a favor and go to the nearest gas station and buy a can of de-icer to keep in the car. And make sure you lube every time you use deicer. In fact, lube all your locks with Hilco spray lubricant to protect against ice and damage. Better yet, lube any metal that’s going to be exposed to the elements. It cleans, it lubricates and it prevent erosion. Why do people tell you to keep de-icer in your car? If you need de-icer, having it in your car isn’t going to help! It needs to be OUTSIDE of the car so you can get IN the car. Keep a can at work and one in the garage or utility room. Oh wow, that is a very good point! I can’t believe I didn’t think of that until you mentioned it. Good tip!